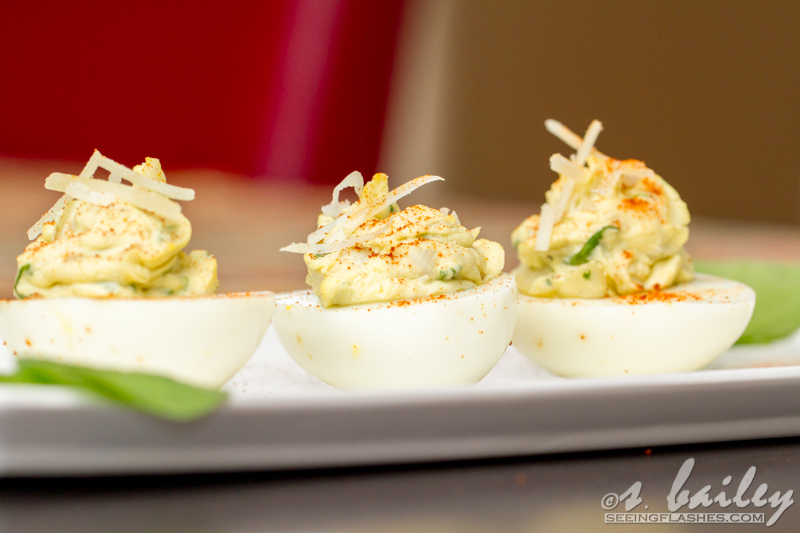 Me: When are deviled eggs in season? 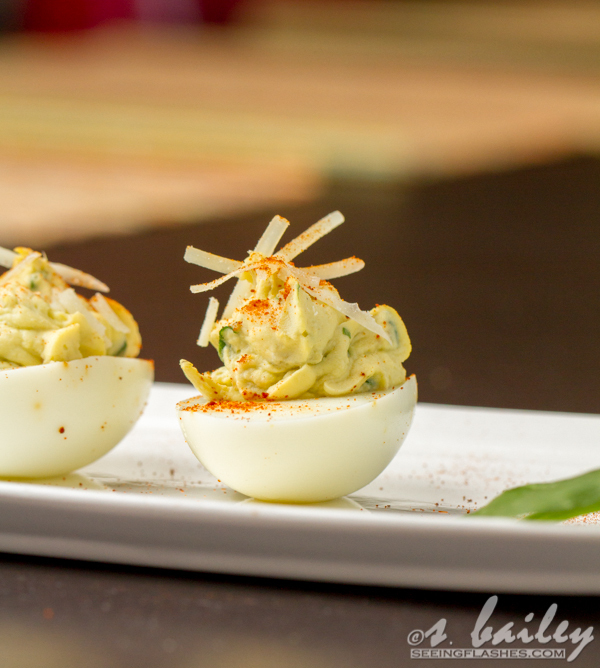 Steve: Umm, deviled eggs are always in season. But with all the holiday parties going on this time of year, it’s always nice to have an easy recipe on hand that isn’t a dessert since, you know, every single person you know will be bringing ginger cookies and truffles. Including me. I will be bringing dessert. Every.Single.Time. But sometimes I also bring non dessert with my desserts to, ya know, “balance” and “make good choices”. Can we just talk for a moment about the brilliance that is the spinach+artichoke+cheese combination??? So.Freaking.Good. Pretty much every time I go out to eat and they list spinach artichoke dip as an appetizer, I sit there for a good 10 minutes trying to convince myself it’s “healthy” because it has the word spinach in the title. But I have the BEST news. Yes, the BEST. In all caps because I get really excited about food. 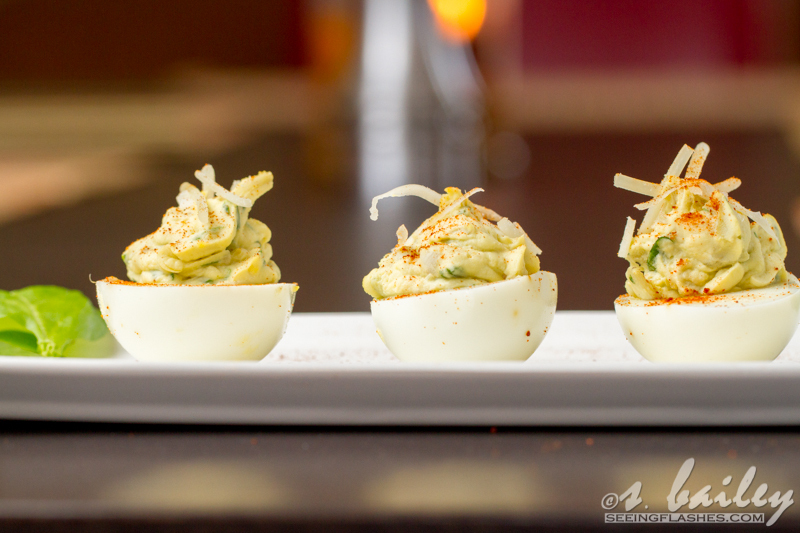 These are the best of, like, every world imaginable–deviled eggs, spinach artichoke dip, and still being able to fit into your pre-holiday-jeans all in one perfect little egg! 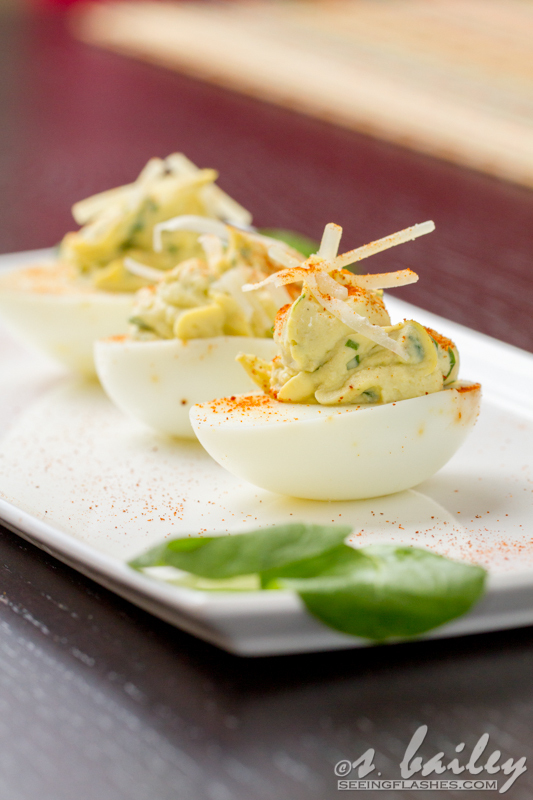 Split hard boiled eggs length wise and scoop the yolks out into a medium mixing bowl. 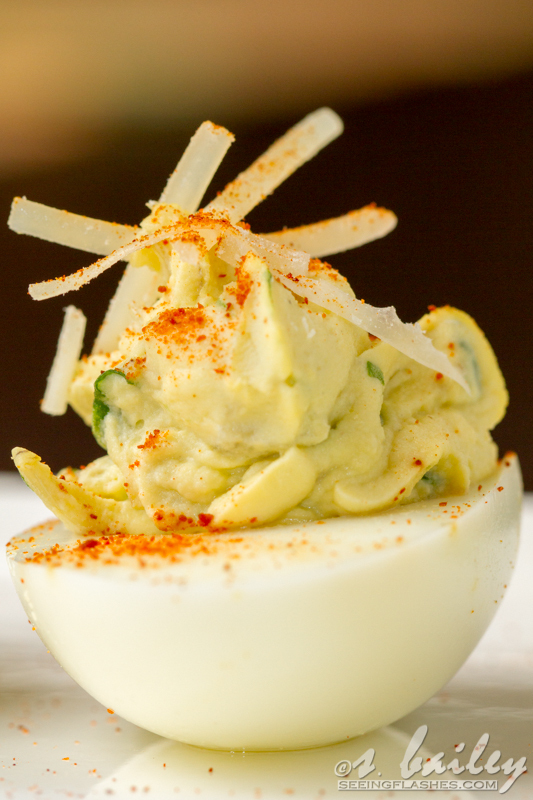 Add Greek yogurt, miracle whip/mayo and cream cheese to egg yolks and beat until well combined. Beat in spinach, artichoke hearts,lemon pepper, Spike and salt. Use a piping bag, extra small cookie scoop or spoon to transfer egg yolk mixture evenly between the egg whites (you may have some extra left over). Top each egg with a pinch of grated parmesan then sprinkle lightly with paprika. You don’t know this about me, but I hate Miracle Whip. Can we still be friends? I stumbled upon your site through Tasteologie and I am floored by your photography! I am a baby blogger and just sent in my first submission to Tasteologie. Needless to say, I have a little crush on your blog. But I’m also a health blogger and focus on healthy Mexican food. I very much related to your weight loss journey, thank you for sharing. Ok, I’m raising my hand. I hate Miracle WHip. Love mayo though. 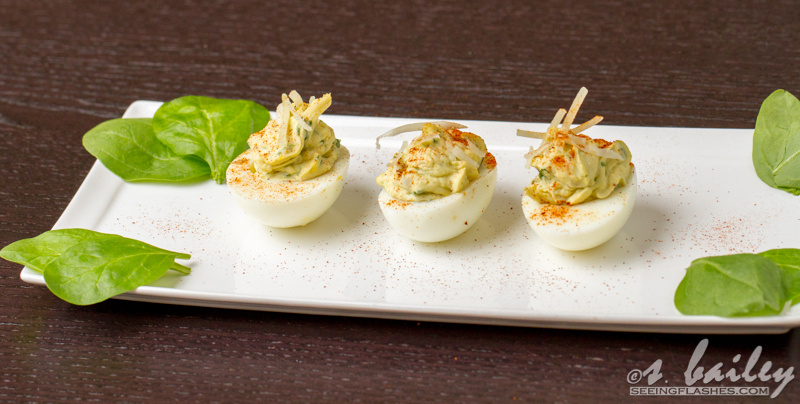 And love deviled eggs. Yours look fantastic! 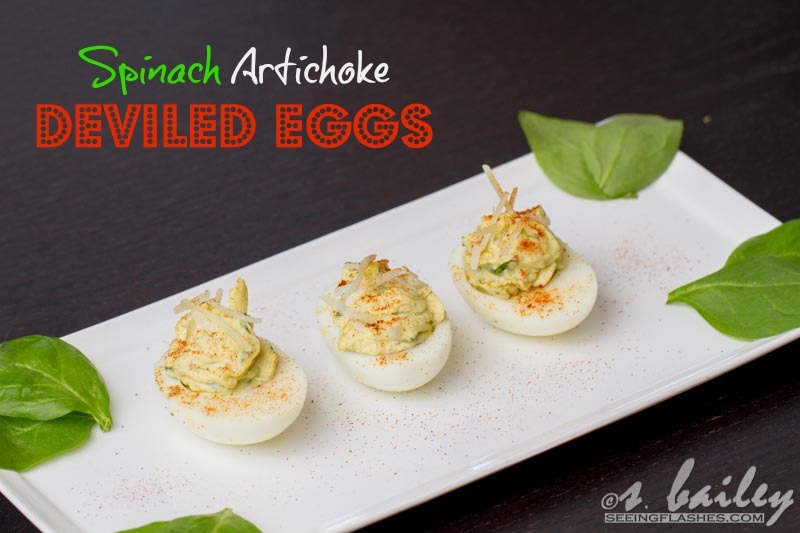 I don’t think I’ve ever seen artichoke spinach ones before. Love, love, love your photography!